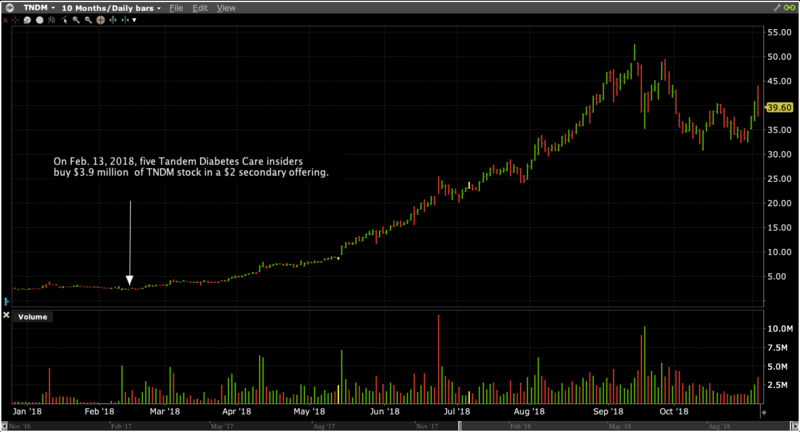 In early 2018 Tandem Diabetes Care (TNDM) traded just above $2 a share – one of a hundred small cap heath care companies with more potential than profits. Bankruptcy seemed more likely than breakout success. No one suspected that by September TNDM would trade at $50, a gain of 2000%? Well, almost no one. On February 13, 2018, five Tandem Diabetes Care corporate insiders disclosed they purchased $3.87 million of TNDM at $2 per share. The officers and directors bought TNDM shares as part of a $60 million secondary offering. The oversized buying by the executives was a prelude to major appreciation. Following the insiders into TNDM would have been amazingly profitable. But hindsight is, as they say, 20-20. Is it possible to use insider buying analysis to identify stocks like TNDM before they skyrocket? What exactly were the “tells” in February of 2018 that suggested TNDM was poised to surge higher? It makes sense that insiders would buy increasing amounts of stock as the information they possess becomes increasingly valuable. So, if the insiders believe their company’s stock is set to soar, it’s not surprising that insiders might “back up the truck” and buy. But $3.9 million is an especially large buying cluster – especially for a small cap company. It’s obvious insiders believed TNDM shares were a great deal. They could have been wrong, but their conviction was evident in the aggressive purchases. 2. Buying by key executives. Kim Blickenstaff, TNDM’s President and CEO was a big buyer in the secondary. Director Douglas Roeder, an experienced health care venture capitalist, and a director since 2009, bought $2 million. These two probably knew more about the company than anyone, and they were placing big bets. 3. Large % holdings increase by insiders. CEO Kim Blickenstaff owned 486,490 shares of TNDM before he added 750,000 in the secondary. That’s a 154% increase – sizeable. The other insiders’ position increases were even greater. These were not token trades – it was smart businesspeople aggressively increasing their skin in the game. When multiple insiders of a company are buying, the likelihood increases that they are trading based on favorable company information rather than for liquidity or personal reasons. In early February, insiders were consensus buyers, and no TNDM insider had sold a share in over two years. 5. Insider buying at a small cap firm. When the secondary was announced, TNDM’s market cap was a bit above $25 million. That qualifies as micro-cap. While following insiders of large-cap firms can be profitable, there is more leverage investing in small caps. Mimicking insiders at little companies, while relatively riskier, can lead to huge gains. 6. Insiders buying a big chunk of a secondary. Secondary offerings are generally perceived as negative by investors – secondaries increase shares outstanding, thus diluting shareholders’ earnings. Also, offerings are typically priced below market price to entice investors. And Insiders are typically sellers in the offering – not something outside investors like to see. However, though the February TNDM offering was dilutive and priced slightly below market, corporate insiders bought 6.5% of the offering. Last, but not least, Tandem Diabetes Care had an intriguing story. 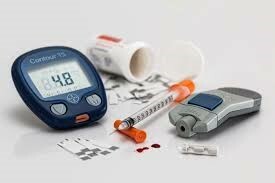 The company had developed insulin pumps that were a breakthrough for diabetes sufferers. And with a market cap of $25 million, TNDM was on the verge of challenging Medtronic (MDT) in a market that generated $2 billion+ for MDT in 2017. This January 11, 2018 article in Seeking Alpha was a table pounder, laying out a bullish case for the stock. If a company has a great story, and insiders are indifferent or are selling, that’s one thing. But if there’s a compelling narrative and insiders are loading up on their own stock, it signals something else – a potentially lucrative opportunity.